Travelers have marveled at Egypt’s archaeological wonders for centuries, ever since the Ancient Greeks first visited the pyramids. Today, millions of tourists are still attracted each year to the pyramids, temples, mosques and great monuments of the Nile Valley, as well as the stunning diving resorts of the Red Sea. Hidden Trails offers quality Egyptian horse riding holidays which combine great desert horseback riding with the typical pyramid and museum visits – so you can find your thrills with your “Lawrence of Arabia” fantasies and still see the sites as well! 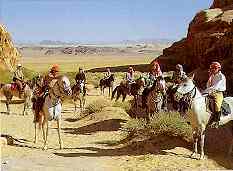 Hidden Trails’ horseback vacation the Desert & Pyramids Ride is based in Cairo, with excursions into the desert to visit the pyramids and trips to the other famous Egyptian tourist attractions – like the Egyptian Museum and Coptic and Islamic Cairo. On this fantastic horse riding tour you will be based out of a 5 star hotel, with the opportunity to visit many of Egypt's top pyramids – including the Sun Temple of Niuserre, the Giza Pyramids, the Bent and Red Pyramids, the Step Pyramid and the Pyramids of Abu Sir. Your trip will end with an evening Nile River Cruise, to soak up Cairo’s night time ambiance. For longer stays in Egypt, Hurghada and Sharm el-Sheik, on the Red Sea coast are doors to a magical underwater world of Technicolor fish and coral that draws divers from around the world, while other adventurous travelers head inland. Here, you can also discover monasteries amid the arid mountains of Sinai or the distant desert oases, home to the hardy nomads whose camel trains still wander the Saharan sands. The weather in Cairo is always warm or hot and the nights cool, with only two seasons: a very hot summer between May and October, and a mild winter from November to April. Cairo is very dry, receiving on average of only about a centimeter of rain a year, but it does have high humidity levels in summer. The city occasionally experiences dust storms brought by the sirocco hot winds that are characteristic of Egypt's climate in the month of April.